View from our room at The Andaz-perfect hotel and perfect location! SHHHHHH….the librarian tour guide at the NYC Public Library glared at Thom and I as we quietly discussed a salient point to what she was elaborating on. DO. NOT. TALK. The message was clear and, properly chastised, we tried to remain silent for the rest of the one hour tour. Damn, it’s hard to be silent. Ranging in age from super old to ridiculously youthful, our tour group cohorts smirked at us including giving us the “oh no you didn’t” shameful sign. Being quiet did allow us to learn ALOT about the NYC library along the way on our recent stay in NYC. Silence is golden. Well, to most people. Opened in 1911, the unofficial “People’s Palace” was built on the site of a former reservoir that featured a promenade around it for the ladies with hats and gents could stroll back in the day. NYC Public Library is a library of record that has many collection rooms scattered throughout featuring the good, bad and truthful record of people over time. We saw rooms for ancestory, the top 10 map collections in the world, historical records including an archive of menus from NYC to record our appetite timeline for posterity. Lions are everywhere from the huge statutes out front to the small heads by what were the water fountains before they discovered the pipes were lead and not safe-now just for show. They used to put wreaths at the holidays around the lion heads until some idiot set them on fire so no more holiday decorations for these lions. Damn fools. Pooh lives here. Who knew? You can see the real stuffed animals that inspired the Winnie-the-Pooh stories. In Room 328 Rare Books, you can see letters from Columbus, who thought he was by the New China Sea when he was checking out the US. I guess people were disappointed that he didn’t discover human monstrosities on his tour. Of course, Trump hadn’t been born yet. Also in Room 328 is Thomas Jefferson’s original declaration of independence before the Continental Congress took it over and revised it. Also kept here is the world’s most valuable baseball card. What ball player you may ask?? Honus Wagner. Never heard of him. That’s probably blasphemous but just true. Our trusty tour guide told us that baseball cards used to come with cigarettes purchases. Yep, encourage the kids to light up and collect cards. Of course, we had to check out the famous Gutenberg bible on display-one of 2 copies that are rotated to keep them in top shape, changing the pages open regularly. The black ink is typeset but the red letters were hand written. While the Rose Main reading room (iconic site used in Ghostbusters movie) was closed for renovation after parts of the aging ceiling fell down, there were so many other areas to check out that I didn’t miss it. On previous visits, that is usually all we saw. Well, besides the convenient public bathroom on the 2nd floor that we knew was there and used when in the neighborhood touring and needed a facility. There is a quite extensive collection exhibited on Alexander Hamilton who is now a rock star thanks to the Broadway hit. Seeing the letters he wrote to his wife and all the official work he did for this country was very interesting, being the scholar and scoundrel that he was most definitely in real life. 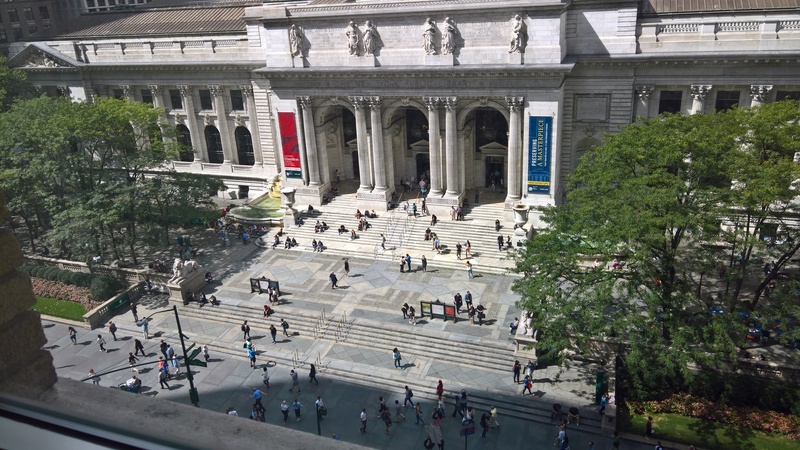 As the tour wound down, our tour guide shared that the NYC PL was really all about inspiring life long learning and a passion for the community–one of the last bastion of civilizations–and sternly told us that libraries will never be obsolete. I hope not. My fondest childhood memories are of the Noblesville Public Library, a downtown brick multi-level joy that is no longer used as a library, but where I could escape and become immersed in a different world with my beloved books. A Wrinkle in Time was my all-time favorite book. I’ve shared my love of reading with my family who all think that the best present you can give is a book and the best place you can spend your day is immersed in a great library.